Those seeking a trophy whitetail deer will work hard for it by scouting for it as any trophy success easily achieved without good deer scouting is typically a once in a lifetime deer. No surprises in this statement and its posting on this page is to insure we all agree what successful trophy whitetail deer hunts require. This agreement then forms the basis for our rules that not only permit but encourage pre-season scouting. 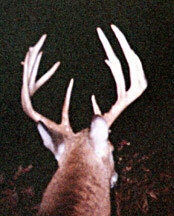 This is the trophy whitetail deer quality many hunter’s desire to hunt. A respectable rack and large body, and very difficult to harvest. Taking the average width between upright ear tips of 14-16 inch spread this view gives a good idea as to the rack size. This rack would easily extend above any pick up truck bed rail. 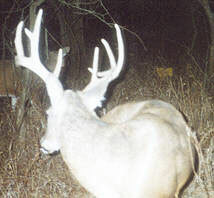 We believe this picture is the same buck as the two pictures above and was taken the following summer about 300 yards away. On the same trail network as the one above down about 200 yards. While many deer hunters are not surprised that most of these are nocturnal pictures believing most if not all trophy whitetail deer movement is at night, continuing on through this scouting section will disprove that nocturnal idea. The once in a lifetime trophy whitetail deer happens and frustrates many hunters that have hunted our private lease land for years and are surprised to see the many, to include non-resident, hunters in the Association that harvest a trophy whitetail deer on their first deer hunt. And, sometimes without any pre season deer scouting. 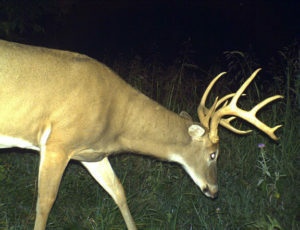 This brings us to the discussion of the deer pictures on this page and the sometimes lack of value scouting has. 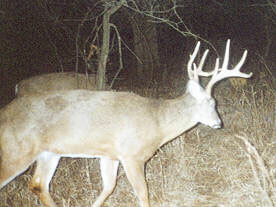 The trophy whitetail deer on this page are from a single farm that has had many a good and several trophy whitetail on it and never has one been harvested from it. And, in this case the amount of deer scouting it has received should indicate otherwise. This inverse relationship between the amount of scouting this farm has had from several hunters and the fact that not one since this land was secured in the middle 1990’s has a single trophy whitetail deer been harvested from it is part of the evidence we have observed over a good many years how hunters seem to outsmart themselves of where to hunt. This observation has lead to other encouragements from the MAHA staff to the new to the central mid-west hunter. That encouragement includes to scout between 2,000 and 4,000 acres of our private hunting land within close order, settle on at least four farms to put stands on and spend at the minimum one and preferable two full days in stand on each farm until the one is found where the trophy whitetail deer is on. What this prevents is that our human eye calibration on where we think trophy whitetail deer should be and where they actually are eventually come together. It is a matter of seeing the world as it actually is rather than how we want it to be. This section is not an inventory of our trophy whitetail deer captured on film, but an introduction to the most common whitetail deer habitat in the mid west. The remainder of our scouting section will provide the hunter not yet familiar with Kansas, Missouri or Iowa an idea of the terrain and habitat quality that produce huntable trophy whitetail deer. 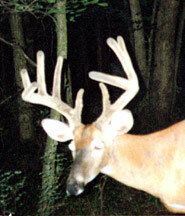 When the MAHA staff recommends trophy whitetail deer land to hunters it is not based on scouting camera photos. Their recommendations derive from first hand experience of being out on the land 12 months a year essentially always scouting where the next trophy whitetail deer will be found. While it may appear we may be over emphasizing watershed or creek bottom deer hunting as prime central mid-west deer habitat understand our motivation for doing so. That motivation is that a very high percentage of the trophy quality deer we have had members harvest have been harvested in some of the seemingly most in-descriptive locations. 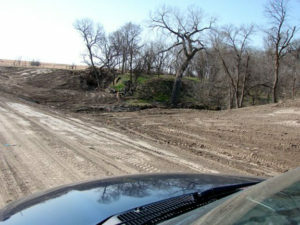 The most common of which have been creek bottoms that appear no different than the miles of other creek bottoms repeatedly found throughout some regions. The challenge is for the self guided hunter to find that one spot of the miles of watersheds where that trophy deer calls home that season. This is north central Kansas on one of the watersheds that eventually flows into the Kansas River. Shown in late spring – early summer at full foliage to give an idea of the cover it provides. Missouri and Iowa are similar with variance due to the rolling timbered ridges of Missouri and the more open drainage’s of Iowa. While there is much more creek bottom to this deer lease than we can capture on one page of pictures we selected these three as they represent three different sub-parcels of the one property. While the entire deer lease is available for scouting when it comes to deer hunting each hunter will commit to a specific sub-parcel ranging from 160 to 320 acres. That requirement to commit to a reservation to one parcel prevents random rather than actual hunter pressure elsewhere during the hunting season. All six sub-parcels of this lease are available to all deer hunters throughout the season on a first come, first served basis. Any one hunter may hunt any he may select every day of his hunt or hunt a different parcel over different days of the deer hunt. The pressure management issue is that one deer hunter may have only one sub parcel each day. Preventing hunters from randomly traveling through land he does not intend to seriously hunt during the hunting season is one means by which we keep private lease land human pressure to as low as we can make it. The ability to represent reality in terms of the deer hunting environment and all of its permeations is tough in picture and text. The better we are able to develop reasonable expectations before membership allocation the better for the hunter and the satisfaction that hunter achieves. To that end we add such pictures that may be considered offbeat for deer hunting as the road work picture below. But, that picture has a part to play in presenting the realities of private land deer hunting. A good reminder in the picture above about road repair, pipeline creek crossing reinforcement, selective logging, power line clearing, crop field waterway work. All these activities take place when weather and work hours allow to include during the hunting season. One hunter somewhere just about every year will find one of his honey holes disturbed by one of these activities. Life is not perfect. Understanding the nature of the environment a reality for those that desire contentment. Thank you Steven for sharing the pattern or the lack of pattern information, always interesting to observe.